BISTRO WASHER (container 400 x 400 mm). 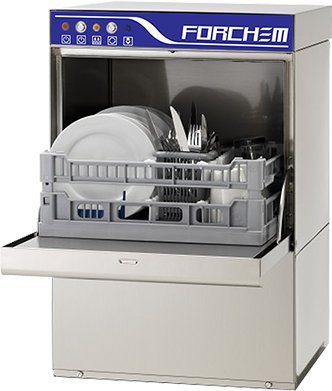 Bistro washer FORCHEM MP 40 is suitable for cleaning different types of dishes, cups and cutlery. This washer has a large construction with simple and safe control panel. Washing system with the upper and bottom arm in combination with double filtration helps to achieve in the time about two minutes the efficient and for glass cost - saving results. The optimal dosage of cleaning agent (that means the quarantee of optimal cleaning result and decreasing the operating costs) is reached by the dispensers which run in the series. Double - cladded stabile door spares the energy and reduces the noise. The control panel and the other objects, which are made from stainless steal, are ideal for daily use. For the comfortable washer maintenance it is able to put away the rail guides of cleaning tank, the double filtration system and the cleaning and rinsing arms without the need to use tools.